NEW YORK (JTA) — American Jews are likely to vote for Hillary Clinton in November, but American Jewry’s fastest-growing community is likely to go the other way. A solid majority of haredi Orthodox Jews will vote for Donald Trump, say experts and Republican operatives in the haredi enclave of Borough Park, Brooklyn. While poll data isn’t available on the fervently Orthodox vote, observers say the haredim are attracted by Trump’s hawkish foreign policy, pugnacious personality and image as a successful businessman. It doesn’t hurt that he’s a man. The haredi community in New York City and in the state has supported Democrats in the past. Both Mayor Bill de Blasio and Gov. Andrew Cuomo have courted the haredi vote by ensuring social services for the poor and promising not to intrude in communal affairs. Borough Park’s state assemblyman, Dov Hikind, is a conservative Democrat. But unlike American Jews in general, who have overwhelmingly voted Democrat in national elections for a century, the haredi community has shifted Republican in the past couple of decades as its numbers have grown, according to Samuel Heilman, who has studied the community for decades as a sociologist at Queens College of the City University of New York. The haredi move rightward parallels a similar move among all American Orthodox Jews, who include the less insular modern Orthodox community. A recent poll of Florida Jews found that Orthodox voters there back Trump by a 3-to-1 margin. Haredim vote Republican, Heilman said, both to distinguish themselves from less observant Jews and because they identify with the party’s social conservatism. He said this election could push haredim to Trump in especially large numbers because Clinton is a woman. Voting a woman into the most powerful position in the world, Heilman said, would be hard for a community whose gender roles are so clearly defined that its newspapers don’t even print photographs of women, including public figures like Clinton. “They don’t want to be like the rest of the Jews,” Heilman said. “The idea that a woman can have the ultimate position doesn’t sit right with them. When the president of the United States makes news, they can’t put a picture of her in Yated Neeman,” a leading haredi paper. But Clinton’s gender is not necessarily a deal-breaker for haredi voters. In the New York Democratic primary election in April, Clinton garnered far more votes than challenger Bernie Sanders in the neighborhood’s haredi areas, winning approximately 70 percent of the vote in some precincts. Yated Neeman’s editor, Pinchos Lipschutz, has written several columns praising Trump for being authentic while bashing Clinton’s perceived dishonesty. In a February column, he wrote that the voters are supporting Trump almost like the Children of Israel supported Moses. Friedman, who also campaigned for Republican presidents Ronald Reagan and George W. Bush, has been making the policy case for Trump in Borough Park. 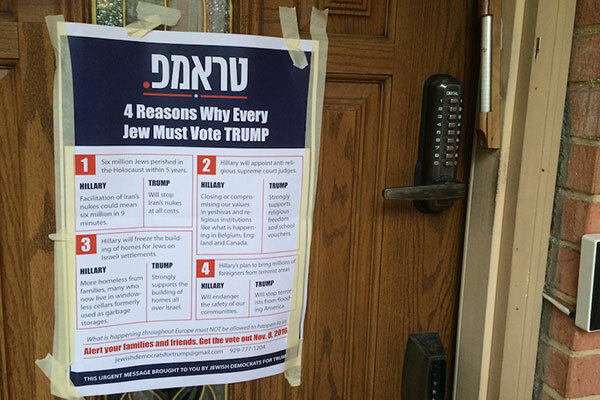 A flier he posted in synagogues around the neighborhood lists four reasons to support Trump: opposition to Iran obtaining a nuclear bomb; support for Israeli West Bank settlement; his pledge to nominate a conservative Supreme Court justice; and his opposition to Syrian refugees entering the country. Friedman changed his license plate to “TRUMP 17” in honor of the candidate’s would-be inauguration year, and believes there is a “silent majority” of haredi Jews who are too bashful to voice their support for Trump. He says support for Trump is especially strong among young haredim, who use the internet and have access to right-wing websites. 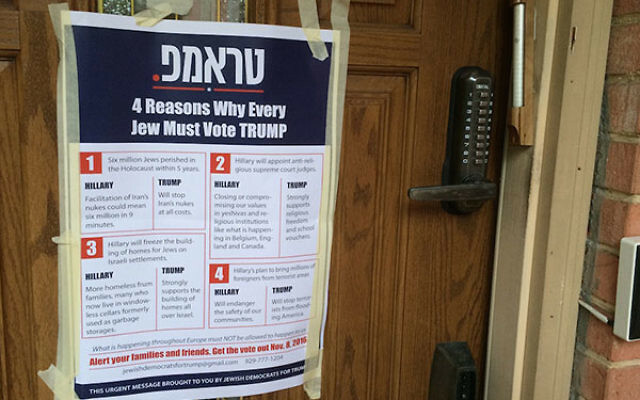 Trump’s controversial statements and brusque demeanor have left some Borough Park Jews ambivalent. Like Orthodox Jews in Florida, several told JTA that they were dissatisfied with both candidates and are still weighing their options. Hikind, a Democrat who has supported Republicans in the past, made a video two weeks ago coming out against Clinton due to her support for the agreement last year curbing Iran’s nuclear program that critics deem weak. He stressed that he cannot yet endorse Trump because of the candidate’s divisive statements, though Hikind expected most of his haredi constituents to back the developer and TV reality star. The largest haredi communities in the United States are in New York and New Jersey, traditionally Democratic states that will almost certainly go for Clinton even if the haredim turn out massively for Trump. But Friedman says highlighting the haredi vote is important both because more liberal Jews look to haredim to validate their Jewish choices, and because a high haredi birth rate means that it is the future of the Jewish community.